What makes a pet cat unique? Cats make wonderful companions. Cats are very entertaining and affectionate making them a popular pet. They are easy to house-train, adaptable to a variety of households, and relatively low maintenance- therefore a great pet option for busy families. What choices do I have in cats? First, one must consider a cat or kitten. A mature cat will arrive to your home with “mature personality”. Once an adopted cat acclimates to your home, he/she isn’t going to change in personality and behaviors. A kitten is an adorable ball of “juvenile personality” and less predictable of their mature personality and health. In addition, cats usually require less veterinary care regarding vaccines and spay/neuter. Next consideration is mixed-breed or purebred cat. Cats come in many of shapes (head, body, tail, etc. ), sizes, colors, personalities and hair coats. The majority of pet cats in the US are mixed-breed domestic cats. Mixed-breed cats are far less expensive, born with all shapes, colors and sizes, have varied personality characteristics, and make wonderful pets. 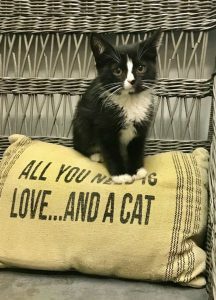 In addition, adopting a domestic cat/kitten is very rewarding as all animal shelter cat wards, as well as all local pet rescue organizations, are overcrowded with homeless cats and kittens. Purebred cats have been exclusively bred to enhance certain physical and behavioral characteristics that some owners find highly desirable. Purebred cats are very expensive and can have genetic health issues related to their specific breed. 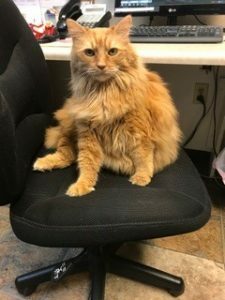 Animal Hospital of West Chester staff is always available to answer any questions or concerns regarding your pet cat considerations. We work closely with many local rescue organizations and, at times, have access to homeless cats and kittens. Final consideration is one or two? Cats are very social pets. Having a “playmate” may significantly elevate your cat’s enrichment and activity level. Please contact the staff at Animal Hospital of West Chester to discuss specific needs of a double cat household. 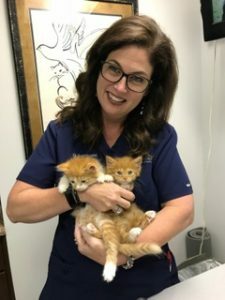 Whether you are adding a second cat or considering 2 kittens, we have practical pet care experience to personalize your considerations. For example; male or female? 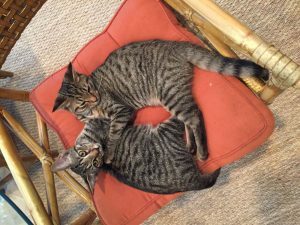 Should second cat be a kitten or mature cat? How many litter boxes? Of course, everyone wants a healthy and happy well-balanced cat. Healthy cats need daily: grain-free feedings, fresh water, social interactions, exercise, enrichment, play time, grooming, and elimination. It is considered an unhealthy lifestyle to just “coexist” with your cat. Cats are a very social and physically active species. If a cat’s daily life lacks enrichment and physical activity we pet professionals will see an increased rate of health issues. A HAPPY CAT IS A HEALTHY CAT! Many cats have long or thick hair coats that will require daily grooming to prevent any matting or possible skin irritation. The Animal Hospital of West Chester offers a full grooming service. Cats make fantastic companions. They will be a part of your life for many years. We encourage you to invest the time and effort necessary to make your years together happy & healthy ones. When you choose a pet, you are promising to care for it for its entire life. The Animal Hospital of West Chester is always available for NEW PET CONSULTATIONS. We will help you choose wisely, keep your promise, and ENJOY one of life’s most rewarding experiences!